No matter what project you’re working on be it on the job or at home we always have just the equipment you need to get the job done right and on time. Pro Star Rental is always keeping up to date on the best equipment out there and adding new ones to our treasure trove. We have recently added new equipment to make sure that you can get started on projects as the weather starts to warm up and school breaks start up. Here are a couple of home projects that will help make your home beautiful for the summer season just ahead. Recently we have added a hot water pressure washer to our collection of equipment which is a true gem among our tools that we have. This particular piece of equipment comes in handy when trying to up the curbside appeal of your home. It is more than just a pressure washer that you point at the concrete to clean it. The added feature of hot water allows for a smoother, quicker, and a cleaner surface. This piece of equipment is able to take off oil, grease and grime. So, if you’re looking at your concrete driveway or even garage and see these type of stains, don’t be discouraged. These stains easily come off with this little gem that you can rent from us today! Another key piece of equipment that many are in need of today is a stump grinder. Here in Texas we have so many trees! There are also storms that come through that knock them down. Or you may choose to cut them down for a number of reasons. Whatever the reason you have for a stump in your yard we have the tool needed to get it out. A stump grinder is easy to use and can be done in a day even if you have more than one stump. This is often times much cheaper then paying someone else to do the job for you. So, whether you need it for a whole day, half a day, or more we’ve got you covered. We have what you need to complete all your home projects. With spring here, there are many people who will be starting up all their home projects. Businesses may be picking up as the weather is getting better. So, whether you need it for business or a home project, we’ve got you covered. Don’t hesitate to call us or come in today. 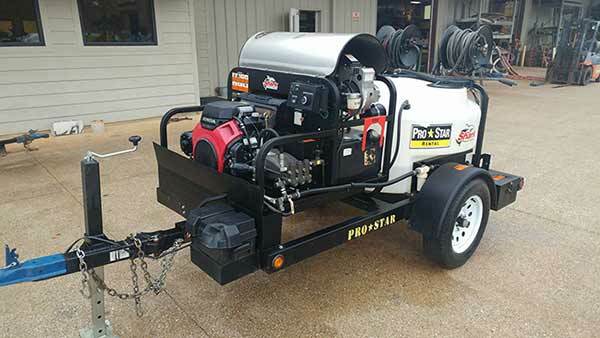 We have much more than just hot water pressure washers and stump grinders here at Pro Star Rentals. You name it and we’ve got it. Our locations are in Longview, Nacogdoches, Tyler, Waxahachie, Waco, and Wichita Falls, TX.